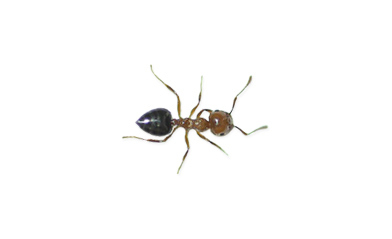 Inside buildings, Acrobat Ants typically nest in wood that has been subjected to high moisture – like leaky plumbing. Outside, most species nest under rocks or in logs, firewood or trees. Sometimes the only exterior indication of damage is the accumulation of debris expelled by these ants. Inspection is the key to successful control of Acrobat Ants. When workers are found indoors, look for signs of excessive moisture and eliminate the problem. Ants entering from outside can be managed by sealing exterior cracks.